Some random thoughts for the last Friday in August. This summer went by so quickly! 1.) Earlier this week, I came in our side garage door and noticed this. I have a bucket of shells on a table just inside the door, and something (I’m not sure what) had created a prism reflecting on one of the shells. 2.) Speaking of the seashore, my friend and I went shelling Wednesday. And I found a shark’s tooth! It’s much larger than the ones I recall my friends finding when we were kids. When you think of all the sand and all the shells at the beach, it’s just amazing to find something so special. For those of you not from this area, there are no sharks in that river now, so I can’t imagine how old this is. 3.) Today is Motor Mum’s (Motor Man’s Mom’s) birthday. 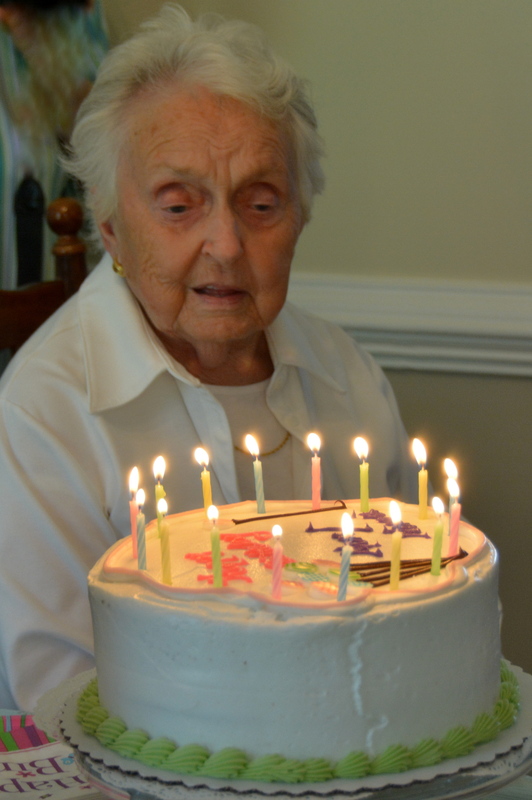 We honored her at a party earlier this week, but will celebrate again at dinner this evening. 4.) And at Motor Mum’s birthday party, I took this picture of our great niece, Livy, while she was playing in the yard. I love her expression; sweet little barefoot-girl innocence. 5.) One of my blogging friends said good-bye to her sweet kitty this week, and another is awaiting test results on her kitty. It’s important to indulge in those tummy rubs whenever the invitation arises. Happy Labor Day weekend, friends. Be safe. This entry was posted in Days at Home, Family, Gypsy and tagged barefoot girl, kitty tummy rubs, mother-in-law birthday, prism on seashell, sharks tooth, tabby kitty. Bookmark the permalink. Oh your little Gypsy is adorable! Oh I just loved everything about this post, Dianna .. the rainbow prism, the shark tooth (prairie girl says WOW! ), Motor Mum, Livy dancing and your sweet kitty – and others saying good-bye to theirs. A reminder that life is precious and slips past in a blink of an eye. Happy Birthday to Motor Mum. It looks like it was a wonderful party. this was fun today and i am so happy to be here…….forget about that prism, i want that bucket of shells!! happy birthday mm, the youthful child is adorable. ps….we are leaving today for chapel hill, nc to visit my son. if you have time to suggest anything or i will spend a little extra time on google, i forgot about lighthouses!!! really nice to see you today. there are so many wonderful bloggers and so little time (esp in summer) for visits!!! Happy birthday to the birthday girl! Always give as many tummy rubs as you can. 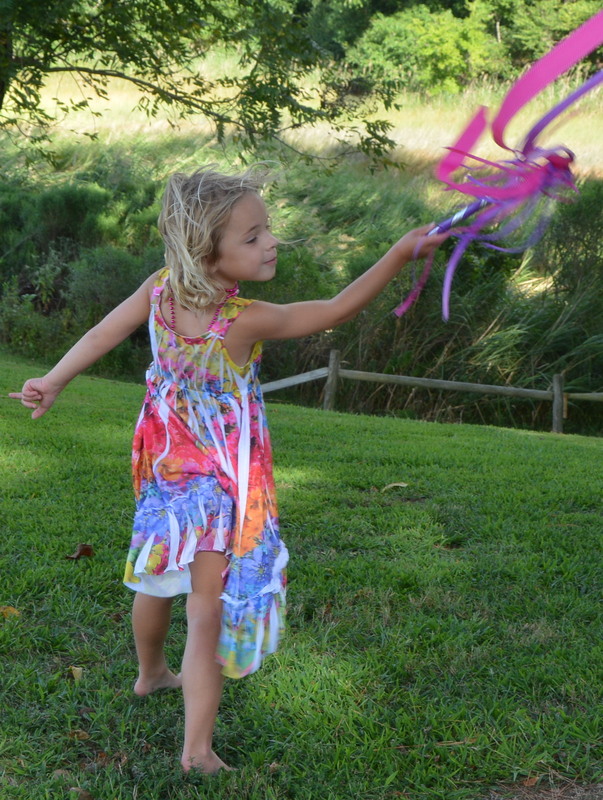 I love the picture of Livy…it perfectly captures those carefree childhood summers. And the “rainbow” shell is special. Love those shark teeth! So who enjoys kitty tummy rubs more.. the kitties or the peeps. I love giving them! Happy Birthday to Motor Mum! Enjoy the holiday.. we have family in from Nevada, a wedding, and a BBQ! We are going to be busy! This is a wonderful random five. Life is so precious. The poignancy of Motor Mum and your Niece’s pictures side by side. Yes belly rubs always be indulged you are so right. Enjoy your week-end one of my favorite blogging peeps! 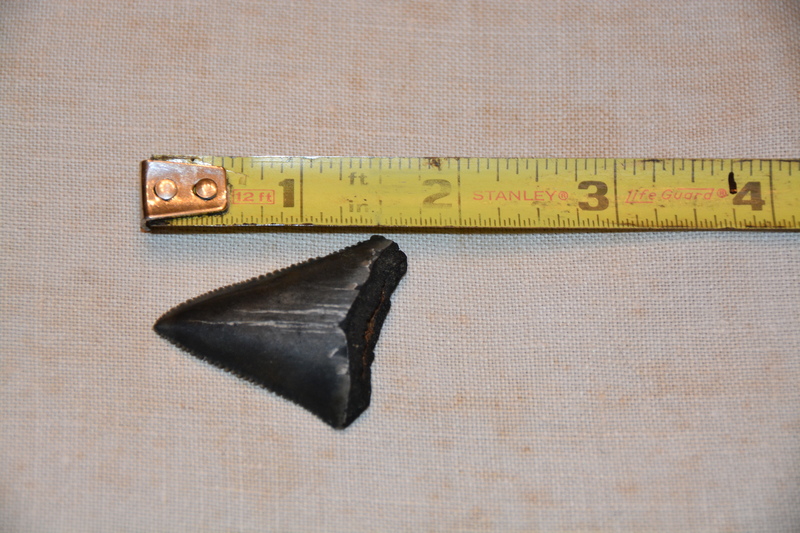 great shark’s tooth find! love the photos today. happy birthday to motor mum! Since your sister gave me the link to your blog I h ave been looking in most days. Just love all your photos from a part of the world I have never visited. Enjoy your long weekend, can’t believe the summer is coming to an end. 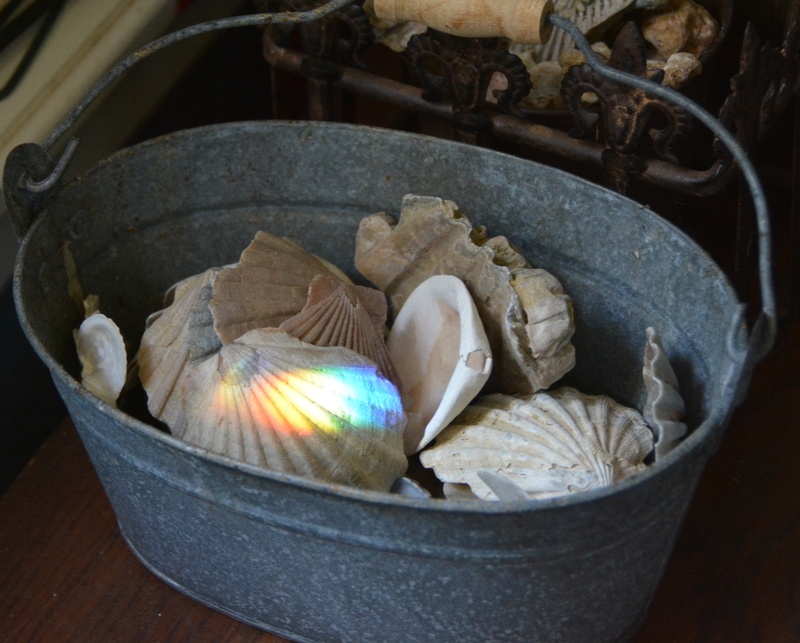 My random thoughts on your random blog: Love the bucket of shells and by the way those are very, very old too! The sharks tooth is huge! Happy Birthday Mrs. Keen! The picture of Livy is Lovely with Lively colors! Our pets just don’t live long enough so pet them every chance you get. #2- love it…. really enjoyed inspecting it earlier- definitely a find! #3- Happy Birthday – looking forward to dinner ! #4- now THIS is what they call ” in the moment ” ! #5- Snugg doesn’t go for tummy rubs, but I give him crunchies whenever he wants ’em !! Your shark tooth is amazing. It would be pretty neat to find out how old it is. As big as that tooth is, I wonder if it’s from a megalodon. My son found a megalodon tooth and it’s really big. Livy is precious. She looks like a sweet angel enjoying life and happiness. I’m sad to learn of your friends loss and your other friend’s having a sick 4 footed friend. 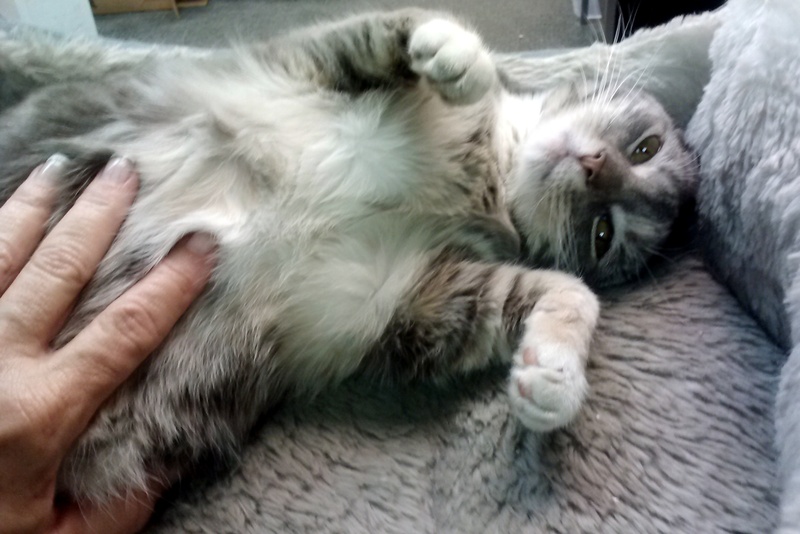 The tummy rubs are a treasure for both human and fur-babe. Oh I didn’t get an email of your post today! Boooo WordPress! Lovely shells….you find the BEST treasures! Great random finds. The Prism is delightful. Wow how cool to find a Sharks tooth. I didn’t realize they were black like that. Happy birthday to Motor Mum, sounds like it was a good party. Your great Niece is darling and of course I agree completely about those kitty belly rubs. Happy birthday to Motor Man’s mother. Happy Birthday to Motor Mum! I may have said this before but I really enjoy your Random Five Fridays. You always have something fun and interesting to show us! Both the prism & shark tooth were special finds. My special find was an end to end rainbow but I didn’t have my camera! 😦 And yes, indulge in those tummy rubs all you can and give both your kitties some from me as I’m still missing my sweet kitty. Looks like a busy week. Pretty prism reflection on the scallop (I think). Nice bucket of shells, any plans for them? Too pretty to leave in the garage. That is a huge tooth, glad you didn’t run into its owner! Good job on the tummy rubs.